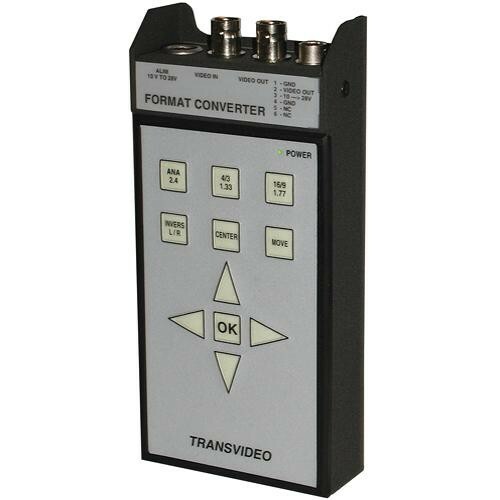 Transvideo's 16:9 and Anamorphic Format Converter will take a squeezed anamorphic or 16:9 image and display it properly on a 4:3 LCD or CRT monitor. Connecting to your PAL or NTSC 4:3 monitor via composite BNC, the unit automatically generates black letterboxing, its digital processing accurately filling the screen with an uncropped image. Moves the unsqueezed image vertically and horizontally into the 4:3 screen. Brings the unsqueezed image automatically in the center of the 4:3 screen. The output signal of the Format Converter may be recorded along with all image manipulations. Can be attached to the back of any monitor via hook-and-loop fastener, including Transvideo flat panel monitors. Box Dimensions (LxWxH) 6.2 x 4.9 x 1.4"